As a result of several discussions I’ve had in recent weeks I’ve become a rather adamant opponent of professional artists. My resolve hardened a little more with every mention of DRM, copy protection, RIAA lawsuits, Stephen Harper’s swift action to condemn camcorders in movie theatres, and other such instances of the co-mingling of business and art. However, I’ve thought long and hard on the issue recently and have come to the conclusion that professional artists do what they do very well, that their talents enable them to create things ordinary people cannot, and that it’s not wrong for them to try to make a living doing what they love. I’ve softened up on the issue a smidge, validating the profession of artist, provided the professional is in tune with the realities of today. And what is this reality I speak of? Simple. It’s the inevitability of the unauthorised digital duplication of art, coupled with the unbridled ease of mass distribution of those copies. Simply stated, if you make something it will be “pirated”. A similar act of robbery, as the hijacking of an airplane. The unauthorized use or reproduction of copyrighted or patented material: software piracy. The operation of an unlicensed, illegal radio or television station. create and distribute something without permission. Doesn’t leave much wiggle room for “content” authors and consumers, does it? This term has been thrown in the spin cycle a couple of times too many. If we are to accept these dissimilar definitions verbatim, art lovers are classified as either consumers or pirates, and artists are classified as licensed or pirates. This is, perhaps, all well and good for the world of yesteryear, but the 21st century marks the birth of World 2.0 (not to be confused with the commercially enfeebled alternative, Microsoft World 2.11 for Workgroups). Thus, a professional artist who accepts the realities of today is an artist who embraces World 2.0. I don’t think I can give a better example of such an artist than San Francisco’s DJ Amber. I discovered Amber while searching for local DJ mix tapes to buy in anticipation of my trip to California last autumn. While I came up empty on locating stores featuring local electronica talent, I was thrilled to find many free mixes for download on her website. To my delight, my favourite mix of the bunch, Live With Friends and Family, was available both for download and for purchase. Cheapskate that I am, I was more than content with my free copy of the content. But, like all people, I enjoy wrapping my mitts around plastic goods so I emailed Amber to express my interest in a CD. She replied with a PayPal address into which I transferred $10 USD, gave her my home address, and under a week later I had the disc in my hands, as illustrated below! I had a special request for this order, and as you can see, Amber heartily fulfilled it! In the age of the participatory internet, World 2.0, people are free to share and download content in nearly any format. One of the media mankind was most enthusiastic to share was music, and the unregulated sharing of this medium is now widespread and irrepressible. This fact spells one thing – music is now worthless. To sell music in the 21st century is to sell sand to Bedouins. Copy protection is not the solution to this equation. Copy protection only frustrates those who purchased the product. Laws like the Digital Millennium Copyright Act only wrest citizens’ right to control the products they legally own. Digital Rights Management is merely a pseudonym for “Consumer Rights Revocation” and only makes “unmanaged” “pirated” media appear that much more attractive. To close is to shut out. To open is to invite. The music industry still has one last hope – to sell NOT music. What is NOT music? Everything but music! DJ Amber’s is a wonderful example of this. 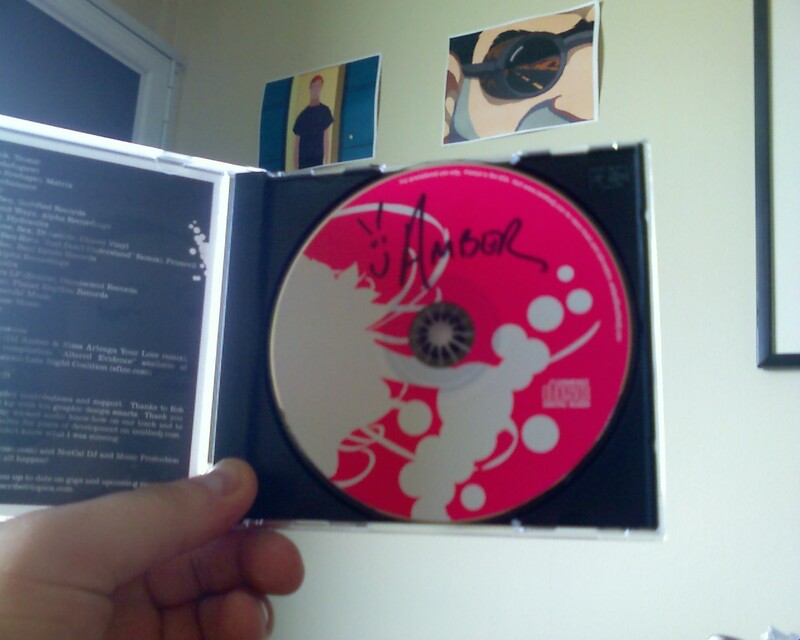 I was given the privilege of speaking personally with the artist I admire, I paid a nominal fee that went directly and entirely to the content creator, I received my product in a timely fashion (with no additional shipping fee), and I got my album freaking autographed!! I don’t think anyone ever bought anything more valuable with a $10 bill. Amber continues to work as a professional musician. She is paid for her performances and her “meatspace” albums. These are unique products and services that only she can provide the world and it is her right to be compensated for her presence and materials. However, Amber is living in the World 2.0. She knows that the internet is a free marketing tool, not a beast to be slain, and she has embraced it by giving her intangible, non-physical creations freely. She knows this material would have been mass-distributed by the populace anyway, so she decided to embrace this inevitability by distributing good-quality copies herself. She’s lost nothing, gained publicity, and smells like roses. MPAA, your business model is gone with the wind. RIAA, the times, they are a-changing. I was stopped behind this truck on the way to work yesterday and just had to snap a picture with my RAZR V3c. 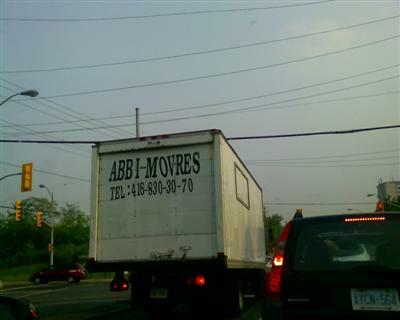 I’ll be sure to call these guys the next time I need something movred.